When we say early child education,here,we mean the formal schooling of a child outside his home. History has it that few decades ago,no child was admitted in school either in nursery,or primary school until five,six years when his hand must have reached his left ear over his head. This indicates that before a child begins formal education,he would have grown and learnt certain things informally. 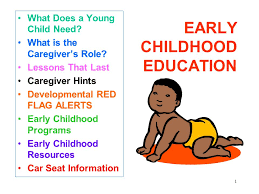 Why early child education is not important? Yes. Are we saying that our modern time is better and wiser than the past? Come to look at this. In the past as we have seen,parents would have made sure that their kids were well taken care of at home,having given them responsible training and parental love before they are old enough to be considered being in school. But today,what do we have? what do we see? We see children,in fact babies in their few months say 8-12 months having been admitted in schools. To learn what? How mummy cooks and sweeps the house? How she keeps the house clean? Or how mummy and daddy relate to keep and maintain peaceful atmosphere at home? Hey,are you saying that all of these beautiful and intelligent things can be learnt through formal education system? NEVER! Research has it that brain development peaks from the age of 3. You see my point on why early child education (formal) is not important? If the brain begins to work from 3 years,of what sense does it make sending kids to school even before they are two,three?